Antimicrobial, antiseptic and stimulating. 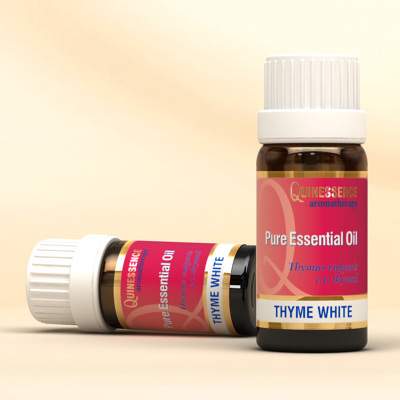 Thyme White is a powerfully antimicrobial essential oil with a strong camphoraceous and herbaceous aroma that smells quite medicinal. It is a circulatory stimulant that is excellent in massage blends to cramps and muscular aches, increase the mobility of stiff joints and combat fatigue. White Thyme Essential Oil exhibits a powerful anti-infectious action, making it the perfect winter essential oil because its expectorant properties stimulate the expulsion of catarrh whilst an antispasmodic action soothes the strain of coughing, plus a powerful antiviral action helps kill off the infection. A few drops of this oil in a diffuser or on a tissue can be inhaled to clear blocked sinuses with the added benefit that it fights off viral infections and purifies the air. Aromatherapists often use White Thyme Essential Oil in acne treatments since it has a more powerful antibacterial effect than benzoyl peroxide.